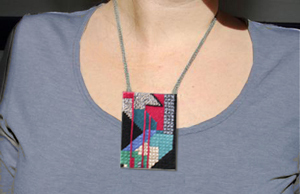 The MOSAIC STITCH was the perfect choice to create abstract needlepoint art for this free necklace design, ‘CITY MOSAICS’. It was designed and stitched exclusively for my eighth VIVA ZIVA ! Newsletter #1108. 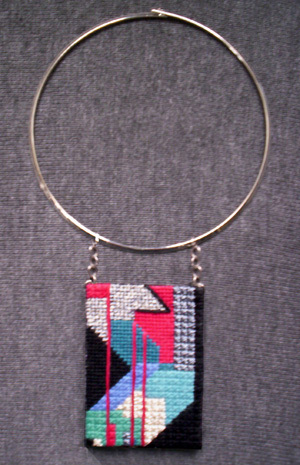 Subscribe now to this free newsletter ... to be released on January 30, 2011... and stitch this dynamic needlepoint necklace design. This bold abstract necklace design finishes off this contemporary look! Add a long chain in silver or pewter and you’re ready to party! NOTE: Full instructions on how to stitch this necklace, including making up instructions are included in the VIVA ZIVA! Newsletter. perfect with pewter and silver metallic threads to fashion a sophisticated shimmering jewel–like pattern. It’s very easy and a lot of fun to stitch! 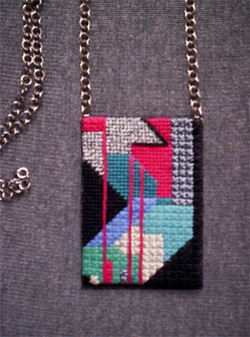 This dramatic needlepoint necklace is approx. 2.5” x 3.5” with bold primary colours to suit any wardrobe palette. The long metallic pewter chain gives it to-day’s look… and you could wear more chains to make a very dynamic effect! TRY OTHER WAYS TO WEAR IT! ...... Or go very sophisticated with the necklace hanging by short silver chains from a silver choker! Needlepoint charts of the ‘CITY MOSAICS’design. The eighth VIVA ZIVA! Newsletter also updates you about my new designs, answers your FAQs and more! Don’t miss this free ’CITY MOSAICS’ NECKLACE DESIGN … make this bold abstract design for your next party! From this free Mosaic Stitch necklace design, go back to Home Page for other designs from the ZIVA Collection.